Roleplay Fitness is a workout with imagination! Players start at the beginning and must pass through a series of challenges along the way. The results of these challenges include exercise. You play with an imaginary character. What’s your name? How do you look? How do you feel? Each character starts off with 10 HP (hit points). You’ll need to keep track of these as you move through the game. If you lose all 10 of your HP, the game is over. You will need to start again. Roleplay Fitness is completely random so every time you play it can be a different result and workout at the same time. You don’t need to finish the entire game campaign in one session. You can pause and come back to where you left off and continue the journey. Now go out there and take on the Dragon! 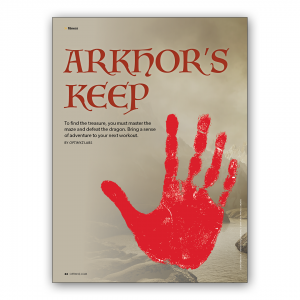 You are an archaeological adventurer working to protect priceless artifacts from other money-hungry adventurers on behalf of the famous Avarian History Museum. 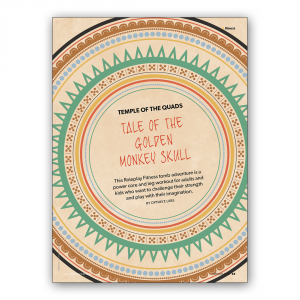 You start your adventure in Avaria after hearing of a golden ape-type skull lost in the temples of the Four Sundrin Rainforest, better known to anthropologists as the Temple of the Quads. You have been searching all over the continents for the valuable golden monkey skull. For this adventure, you must enter each room and complete the exercises to collect a jewel. Luckily, you have already found the moon amulet. You must fill your moon amulet with all six different coloured jewels to enter the Temple of the Quads where it is said the golden skull may be found. Equipment: Floor mat, water bottle, two six-sided dice.